London, United Kingdom - October 22, 2018 /MarketersMedia/ — London, United Kingdom - Along with providing access to healthy organic food products, Superfood World has a strong focus on charity work. Through the company’s Founding Pledge, Superfood World donate 25% of their profits to charity. As customers purchase products, a portion of the proceeds are set aside to make charity projects possible. The company has announced they have reached a milestone with their charitable work and have now been able to build the first Superfood World House, made possibly by the charity fund. The company has shared the news of the house construction, showing customers the difference that purchase of Superfood World products can have on the lives of others located around the world. The first Superfood World home was built for Adbdul Samadi Shereef, a fisherman living in Trincomlaee in Sri Lanka. Mr. Shereef has heart disease and has struggled for some time to have the ability to provide for his wife and children. Mr. Shereef and his family were living in a metal shanty hut, a home that was not protected from the weather of the region as well as providing privacy for the family. 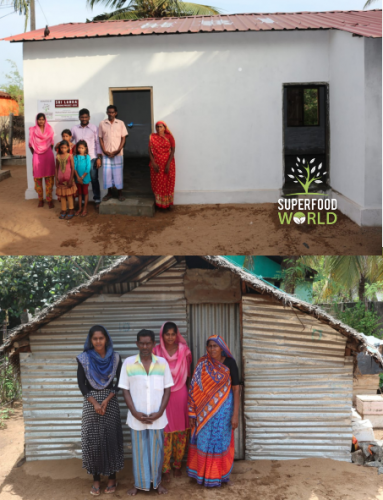 By working with their official charity partner, Medical Relief International, Superfood World was able to build the family a purpose built brick home, improving the standard of living for the Shereef family. Along with the completion of this project, Superfood World is working to develop an Organic Energy Bar, SUPERGIZER, that is aimed will be distributed in poor countries to help treat malnutrition. The company is currently looking for a partner to retail the bar in the United Kingdom, with 25% of profits helping to supply the bars to third world countries. Superfood World products continue to prove highly popular on Amazon in the UK, allowing consumers to play a vital role in the company’s charity work. About Superfood World: As a top provider of Organic Certified health products, Superfood World focuses on sharing the benefits of healthy living. The mission of Superfood World is to provide the best organic health foods and at the same time, make a difference in the world by helping the less fortunate. The company has made it a mission to donate 25% of their profits to charity and is the Official Sponsor of Medical Relief International (MRI) to help fund poverty relief, medical aid and sustainability projects around the world.